Welcome to the Hotel Sinclairs in Siliguri, a luxury hotel in Pradhan Nagar, at the centre of the city. Renowned for its luxurious facilities and services, the hotel is suitable for both pleasure and business travellers touring the region. In fact, Sinclairs Siliguri has been thought to be the ideal business hotel with remarkable facilities for hosting seminars and conferences. Sinclairs Hotel in Siliguri is at a convenient distance of only 5 km from New Jalpaiguri Railway Station and 12 km from the Bagdogra Airport. The ISKCON temple is also quite near, being only 8 km away while the hill station of Darjeeling rests about 90 km away from the hotel. 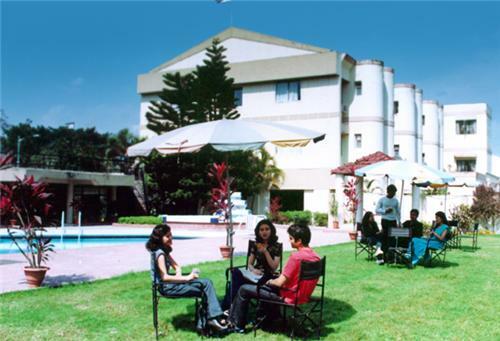 So learn more about this 3-star hotel in Siliguri and indulge in its relaxing pampering break. There are about 41 rooms and 5 luxury suites at this premium hotel. 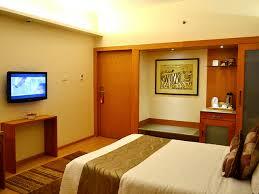 The rooms are categorized as Premier room, Garden suite and Premier suite. Some of the facilities the visitor can avail at the premier rooms are 32 ‘’ LCD TV, Wifi enabled rooms, electronic access, split A.C., rain shower, herbal toiletries, minibar, rainshower and electronic safe. Its premier suite possesses more facilities including In-room tea and coffee maker, Wifi, writing table, refrigerator as well as an attached terrace garden to admire the outside view. A spacious and luxurious bedroom, living room as well as two ensuite bathrooms mark the grandeur of the premier suite which the guests at Sinclairs Hotel enjoy at Siliguri. Relish the delectable meals at the multiple restaurants of Sinclairs in Siliguri. Whether you want to choose an all day dining option or pre-dinner drinks, quick meeting snacks or long conversations with close friends there will be a perfect food accompaniment and venue for every occasion. The Palms is the classic multi-cuisine dining restaurant which serves appetizing local and international cuisines in the scenic backdrop of lush green gardens or the poolside. A number of premium drinks are also available at its well stocked bar. It remains open from 7.30 AM in the morning to 10.30 PM at night. There is also an O3 Lounge Bar styled with chic and colourful interiors and has proven to be an ideal choice for corporate to unwind over snacks and drinks. 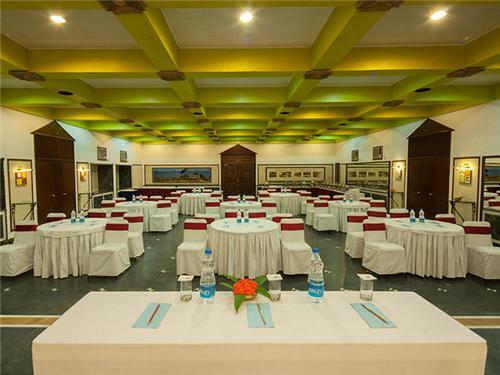 Choose the numerous options for arranging corporate meetings and conferences at the Sinclairs Hotel in Siliguri. It has a total of 6 banquet venues namely, the Durbar, Imperial, Summit, Regency, Emperor and Terrace which make the hotel one of the foremost choices for business travellers to Siliguri. The Durbar is one of the most high profile and sought after banquet venues in Siliguri. It has a classy interior decor and high curved ceilings opening to a large terrace giving a majestic feel to the assembled capacity of 500 guests who can gather here for receptions, corporate events and presentations. The Imperial is another leading corporate venue and stands as a pillar-less structure which has a built-in stage. The Regency is elegantly designed for the purpose of holding a conference and has a capacity of 60 people. For smaller or intimate gatherings, the Summit with a capacity for seating 20 people and the Emperor or a luxuriously designed board room capable of hosting 12 people are apt and admirable choices. Last but not the least, one can also gather for an outdoor meetings at the Terrace, which is an exclusive and inspiring venue for all kinds of events especially attractive during the winter. The Laya Spa in Sinclairs, Siliguri gives you a well deserved break from your exhaustive routine. It provides various aromatic Swedish, traditional massages and rejuvenating therapies to pamper you in a caring environment under professional service giving your body and mind a complete wellness experience. There is also a state-of-the-art gymnasium at Sinclairs Hotel in Siliguri with various equipments like treadmill, cycles, free weights, elliptical and provision for yoga and floor exercises. Besides sauna and steam facility are also available at the hotel. Some of the other facilities at Hotel Sinclairs in Siliguri are a health club, doctor on request, outdoor swimming pool, daily laundry service, and room service, CCTV, elevator, in-house generator, travel arrangements, car parking as well as valet service, open air garden cafe etc. Besides special period packages for limited time are also available. So reserve your stay in Siliguri at the Hotel Sinclairs offering an unforgettable and luxurious experience for all business and leisure travellers.